It all started innocently enough with an email from a friend. Her husband asked her for creamed spinach, and, overwhelmed by the 147,000 (as Googled) creamed spinach recipes, she asked if I had a recipe. However, there was a twist, “Preferably a truffle oil and no nutmeg or no cheese variety.” It has been for-ev-er since I’ve made a basic creamed spinach. Not since I fell absolutely in love with Ina Garten’s recipe for spinach gratin, which of course has nutmeg and cheese, and which you should make immediately because it is delicious. In any event, I set out to make creamed spinach that very evening so I could give her an actual recipe rather than instructions for winging it, or giving her something I hadn’t tried. The easiest possible recipe is to saute some spinach in butter until it is nicely wilted, and then add some warm cream, salt, and pepper. But I wanted to give her something richer, creamier, more of the steakhouse variety. I couldn’t leave out the nutmeg. I think it absolutely belongs in creamed spinach, as it brings out the flavors of the sauce, but whatever you do in your kitchen is up to you. You could also drizzle a little truffle oil over it once it’s finished as an added touch. But then, once I had an entire pot of creamed spinach, what would I do with it? Sure, I could be a glutton and eat it out of the pot standing at the kitchen counter, but I thought there must be some dish I could make with it, rather than just having it as the side to a steak. So I went shopping in my refrigerator. Aha! some polenta I had put in a dish to set after having it soft with sausages earlier in the week, and an egg. I made the creamed spinach and set it aside to cool. 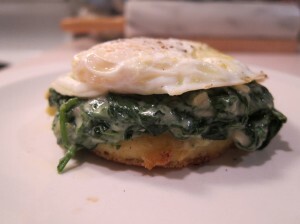 I sauteed a round of polenta until it was extra-crispy on the outside, topped it with some creamed spinach, and finished it off with an over easy egg. It is a pretty magical, satisfying dish, appropriate for any time of the day. With the addition of truffle oil, this would make a wonderful special-occasion brunch dish. This recipe makes 4 to 6 servings of creamed spinach, which may be prepared and reheated up to two days ahead. Although the description here is for one serving, obviously you may use as many rounds of polenta and eggs to make however many servings you require. You will have enough creamed spinach for at least six servings of polenta with spinach and egg. 1. Bring 1.5 inches of water to boil in a very large pot. Salt the water well, add the spinach. Cover the pot for a moment to begin wilting, remove the lid, and stir the spinach gently until well wilted – approx. 1/3 to 1/4 of the volume you started with. 2. Drain the spinach in a colander, immediately running cold water over it to cool. When drained and cool enough to handle, squeeze the water out of it in handfuls, putting the squeezed spinach in a medium bowl lined with a paper towel as you go. 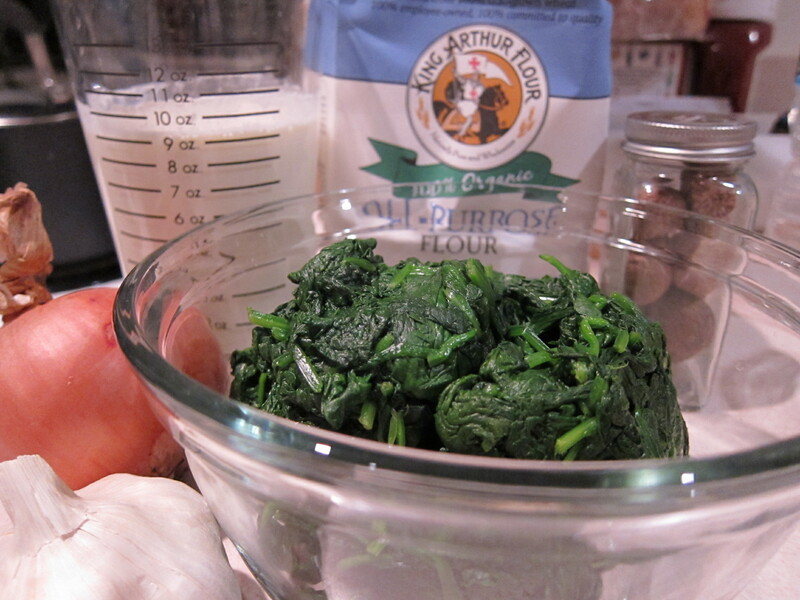 Once thoroughly drained, chop the spinach into large pieces. Don’t worry that the spinach is stuck together, as it will come apart when added to the sauce. 3. Heat the milk and cream in a small saucepan over medium heat (or in the microwave – I heated it for 2.5 minutes at 3% power). Do not boil or simmer, you just want it warm. 4. Meanwhile, melt the butter over medium-low heat in a medium saucepan, and cook the onion and garlic until very soft, approximately 5 minutes. 5. Add the flour to the pot with the onions and garlic, and cook this together, stirring often, for a few minutes on low to cook the roux – you don’t want this to brown (although it will be fine if it does). It will be a pretty solid mass, break it into bits as you stir it. 6. Slowly add the heated milk/cream, whisking like a fiend to make sure there are no lumps. Cook this for 3 to 5 minutes or so. It will be relatively thick, like a thin porridge. If it is too thick, add more milk. 7. Add salt, pepper, and nutmeg. 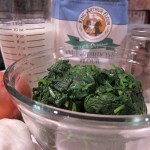 Add the spinach in batches, stirring to blend well. Cook this for another 3 to 5 minutes, stirring often, until warmed throughout. Set this aside while you prepare the rest of the dish. Alternatively, this can be cooled and refrigerated, and reheated the next day. Of course, the creamed spinach may be served as a side dish to any entree, or eaten out of the pot standing over the kitchen counter. If you have not made polenta, it is incredibly easy. 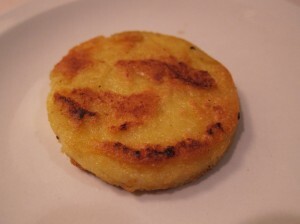 Mark Bittman has a great video on making polenta that can be found here. Once you have cooked, soft polenta, spread it in an approximately 1 inch thick layer in a pan and place in the refrigerator to cool until set. Alternatively, use prepared polenta, which you may find sold in the supermarket, packaged in a cylindrical tube. Use a cookie cutter or rim of a large glass to cut a 3 inch round of set polenta. Alternatively, use a knife to cut any shape you wish, or slice a 1 inch thick slice of prepared polenta. Heat approximately two teaspoons of extra-virgin olive oil in a small, nonstick skillet over medium-high heat. Add the polenta cake and saute until golden and crispy on the outside. (If sauteing several rounds, increase the amount of olive oil, using a larger pan). 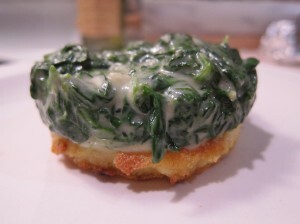 Set polenta cake on a serving dish and top with creamed spinach. Rinse the saute pan so you can use it to cook your egg. Prepare the egg(s). 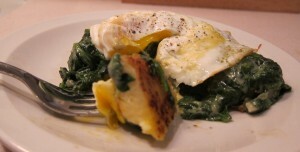 (If you would like instruction on preparing an over easy egg, I like this video from SeriousEats.com.) Top the creamed spinach and polenta cake with the egg. Season the dish with a grind or two of freshly ground black pepper. Serve immediately.